Please welcome short story writer and novelist B. K. Stevens today. I’ve known Bonnie for many years, first from the Guppy Chapter of Sisters in Crime. She describes herself as hard-working, inefficient, bookish, and grateful. Her work she describes as humorous, serious, carefully plotted, and candid. I don’t often give a shout out to other writers’ blogs, but if you want to get into the heads of writers as they craft their opening pages, check out B.K.’s blog http://www.bkstevensmysteries.com/blog/ . Without further interruption from your host, here are her chosen questions and answers. You have a table for four at your favorite restaurant and can invite any three people, living, dead or fictional. Who are your guests (and why) and where are you eating (and why)? The first person on my guest list would have to be my husband, Dennis. I always enjoy special occasions more when he’s there. I’m tempted to make the other two guests our two daughters—they’re all grown up and on their own now, and I miss the days when we all sat down to dinner together every night—but you want something more unusual than that. So I’d invite Golda Meir, because she had such an interesting, significant life and because I respect her so much. I should invite a literary guest, too, and I think it would be Mark Twain. There are other authors whose works I admire even more, but he’s the one most likely to appreciate Golda. I’d love to listen to those two talk to each other. And we’d eat at Jack’s Deli in Cleveland, because it has the best corned beef on the planet. Describe your most productive writing venue. What makes it best for you? My favorite place to write is my big, old-fashioned desk. It has plenty of room for my computer (I hate laptops) and printer, more room for knick-knacks and pictures to keep me company during the inevitably long and lonely writing hours. It also has drawers for files and for crucial writing supplies such as paper clips and sticky notes, along with built-in shelves for the reference books I always want to keep within reach. I love my desk so much that I find it hard to write anywhere else. In most ways, I think, the qualities that make a great novel also make a great short story—memorable and convincing characters, a well-constructed and absorbing plot, compelling themes, and a lucid, lively style. I’d also add “inevitability” to that list—not the most elegant word, but I can’t think of another that works. I love it when all the elements in a short story come together at the end in a way that’s unexpected but instantly feels right, a way that seems so complete and natural that we realize the story couldn’t possibly have ended in any other way. The first mystery story I read as an adult was Clark Howard’s “Scalplock,” which was published in Ellery Queen’s Mystery Magazine back in 1986. (I wish I could say it was published in Alfred Hitchcock’s Mystery Magazine, but alas, it wasn’t.) I still remember how I felt when I reached the final paragraphs of that story—surprised for a moment, and then utterly convinced that this was how the story had to end, that every word since the first sentence had led inevitably to this one conclusion. That was when I decided I wanted to write short stories. What is your most productive time of the day (and do you need caffeine)? Unfortunately, my most productive times are late afternoon and late at night. I wish I could make better use of my mornings, but with a whole day stretching in front of me, it’s too easy to feel that I have plenty of time, that I can debate every decision endlessly and still reach all the goals I’ve set for the day. Not until I take a serious look at the clock and realize my husband will be home from work soon do I feel the urgent need to get down to business and make some decisions. Then, day after day, I fail to reach my goals and have to stay up late at night. And yes, I need caffeine, always—tea until noon, Diet Coke starting at approximately 12:01. Every day, I resolve to drink more tea and less Diet Coke. It hasn’t happened yet. What themes do you regularly employ in your writing? Jim Thompson said, “There is only one plot—things are not as they seem.” Change the word “plot” to “theme,” and that’s the theme I employ most often—but so does just about every other writer, especially just about every mystery writer. Whatever other themes we may develop in our stories and novels, we constantly remind ourselves and each other that we can’t judge by the surface of things, that there’s usually (always?) a discrepancy between appearance and reality. It’s a simple point, and in one sense we all know it already, but it can still be so hard to believe that we have to keep driving it into our heads again and again. But, like most writers of traditional mysteries, I also develop the theme that discovering the truth is possible—almost always difficult, sometimes dangerous, but ultimately possible (and absolutely crucial, too). The same can be said about other good things, from seeing that justice is done to acting honorably to forming true friendships. That all sounds terrible serious, and most of my mysteries are humorous, but serious themes can be developed in humorous ways. How did you develop the idea for your most recent work? I began toying with the idea of writing a young adult mystery about thirteen years ago, when I was teaching English at a high school in Cleveland. Often, students asked me to recommend books they could read for their outside reading or summer reading reports. It was easy to find plenty of good titles to recommend to girls, not so easy to find titles to recommend to boys. Often, when I tried, the boys would respond with a question straight out of The Princess Bride: “Are there any sports?” That’s when I started to think about writing a sports-oriented YA mystery that would give boys the action they yearned for but also give them carefully developed characters and significant themes they could analyze in their reports—and even an occasional figure of speech to keep their English teachers happy. Unfortunately, though, I knew almost nothing about sports, so that idea went on the shelf for a long time. Then, a few years ago, my fifth-degree black belt husband began studying Krav Maga. When he told me about this Israeli self-defense system, I found it fascinating. Maybe, I thought, Krav Maga could be the “sport” at the center of a YA novel, with my husband as a live-in expert who could answer my questions and choreograph the martial arts scenes. That’s when Fighting Chance started to take shape. Name three writers from whom you have drawn inspiration and tell us why. I’ll start with my favorite mystery writer, Dorothy Sayers. During the summer before my senior year in college, I took a seminar at Oxford, and someone suggested I read Gaudy Night because it’s set at the university. I wasn’t a mystery reader back then—I don’t think I’d read a mystery since my Nancy Drew days—but I’d fallen in love with Oxford and decided to read the book for the sake of its setting. I did enjoy the setting, but I enjoyed the characters, the humor, and the carefully constructed plot even more. And the ending left me in awe, just as the ending of “Scalplock” did many years later: Everything came together so perfectly, in an unexpected but inevitable way. I didn’t immediately decide to become a mystery writer—I was too wrapped up in my plans for becoming an English professor—but when I eventually decided to give mystery writing a try, Gaudy Night was my ideal of what a mystery should be. Jane Austen has been another inspiration. Again, I love the humor, the characters, the carefully constructed plots. And I love the way Austen handles romance. For Austen, romance is never just a gimmick. It’s an education and a test of character. When her protagonists fall in love, they learn more about themselves; when they make their romantic choices, they’re forced to make decisions about what’s truly important to them. When I wrote Fighting Chance, I decided to put a teenaged male jock into the sort of romantic dilemma Austen’s heroines face. I found that interesting. I hope young readers agree. The third author I’ll mention is Anthony Trollope. Again, I love his characters, his humor, his wonderfully constructed plots. And I love it that he consciously set out to write popular, entertaining fiction. In an age when writers were supposed to be rarefied, purely aesthetic creatures who cared only about their art, Trollope freely admitted he also wanted to please readers—preferably, a lot of readers. I love Trollope’s novels—especially The Warden and Barchester Towers—and I also love his frank, unpretentious Autobiography. It contains many valuable insights into fiction writing, and it sets an example of honesty that we’d all do well to follow. What was the best piece of writing advice you ever received and why was it so valuable? “Try to be one of those people on whom nothing is lost!” That’s from Henry James’ “The Art of Fiction,” published in 1884, as vital and relevant now as it was then. James reminds us to observe everything carefully and to use both our judgment and our imagination when we search for its significance. What better advice could any writer ever receive? When seventeen-year-old Matt Foley’s coach and mentor is killed in a sparring match at a tae kwon do tournament, the police decide it was a tragic accident. Matt’s not so sure. With help from a few friends, including the attractive but puzzling Graciana Cortez, Matt learns the coach’s opponent, Bobby Davis, is a brutal, highly skilled martial artist, the central attraction at an illegal fight club. Now, Matt’s convinced someone hired Davis to murder the coach. But who would want to harm the coach, and why do it at a tournament? Matt’s efforts to find the truth pull him into some dangerous conflicts. To improve his self-defense skills, he joins a Krav Maga class taught by a man who becomes his new mentor. Matt suspects that he’s going to need those skills, that some day he’ll have to face Bobby Davis himself. Neat, informative Q&A. Well done and enjoyable. Hope your story really takes off with the audience you're trying to reach. As a "used-to-be" tomboy, I think you'll also get some of those girls. Thanks for your kind words. 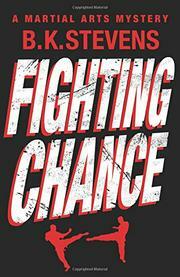 I hope some girls will want to read Fighting Chance, too. There are some strong female characters, especially Graciana Cortez. Also, since both boys and girls face a lot of the same challenges in growing up, I think both will be able to relate to Matt's experiences and emotions. And, of course, lots of girls love martial arts--both of my daughters took tae kwon do in high school, and one has also taken Krav Maga. Hi, B K! What a lovely interview and I like you write short! Me, too. I'm glad you enjoyed the interview, Vicki. Yes, I'm excited about finally getting two novels published--it took a long, long time--but I'll always love writing short stories. I think they present their own distinctive challenges and also offer distinctive rewards, to both writers and readers. I'm glad I'm not alone! I'm constantly amazed by how long I can work and how little I can accomplish. Have you ever watched "Throw Momma from the Train"? The opening minutes are hilarious. So that's how you do it! I love the Jim Thompson quote and have saved it off for inspiration. As I'm sure you know, you're one of my favorite short story writers, so I'm so very happy you're getting what you want done with novels. This one is a wonderful idea and I hope it takes off to the moon! Thanks, Jim and Bonnie! Thanks so much for your kind words and good wishes! I love your stories, too. I'm struck by Jim Thompson's statement because it's hard to think of a literary work to which it doesn't apply. Fairy tales, Hamlet, Pride and Prejudice, the cozy mystery published last week--they all drive home the theme that things are not as they seem. Thanks for your kind words and good wishes, Miriam. I hope you do read more Sayers. Especially in her later novels, the characters are just delightful--sometimes a bit exaggerated, perhaps, but always a lot of fun. Great post, and congratulations on yet another wonderful publication! I love Austen and Trollope, too! Perhaps I should read some more Sayers, I have read some of her work and always enjoyed it, but should go back and read some more of her books. As a Mom to young boy, I know that your thoughts about appealing to boy readers is exactly on point. Good luck with this new book - I hope it finds tremendous success! Wonderful interview, B. K. I love your answer to what makes a great short story. Best wishes with Fighting Chance. Thanks, Catherine! I'm glad you enjoyed the interview. I hadn't thought about that Clark Howard story in years, but the interview brought it to mind, and I really wanted to read it again. That 1886 copy of EQMM is long gone, but luckily Howard reprinted the story in a collection. I ordered it from Amazon and will read it later today.